December 16 is Chocolate-Covered Anything Day. While I didn’t find the original commercial, I did find these two guys singing the song out in some campground or national park—the kind of place where there’s no TV, so people have to find creative ways to amuse themselves. 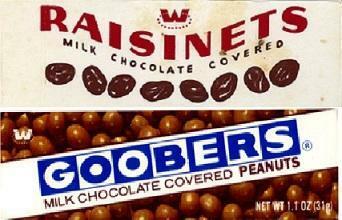 Goobers are delicious peanuts covered in chocolate! Raisinets are raisins covered in chocolate too-oo! Next Keep your damn stumps!